Not exactly earth shattering news. The display industry began rapidly moving towards higher resolutions the moment Apple first unveiled the retina display with it’s iPhone 4 in 2009. What is interesting here is that the trend shows no signs of abating, even as resolutions approach or surpass the acuity of the average human eye. 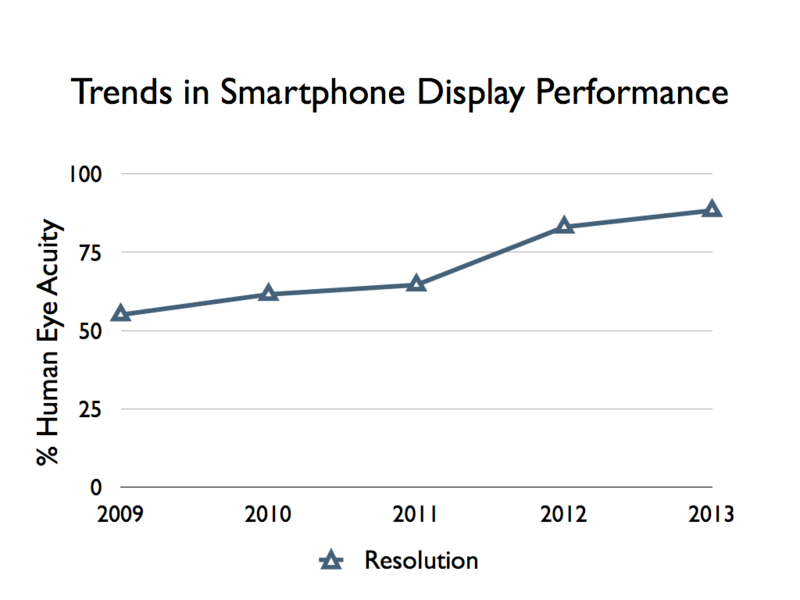 Best performing smartphones in terms of display resolution from 2009 to 2013. Shown as a percentage of what the average human eye can detect. The HTC One is leading the charge this year at 468 ppi. According to Dr. Ray Soneira of DisplayMate, that’s already equivalent to Apple’s retina display for eyes with 20/20 vision at a distance of just 7.4 inches from the eye- much closer than an average user will typically hold the device. The question is- just how noticeable are additional increases in resolution beyond 400-500 ppi going to be for consumers? In my view, resolutions above 530 ppi will be wasted on the vast majority of users. Unless you have near perfect vision and hold your phone excessively close to your eye, you just won’t be able to see the difference. Still, device makers seem intent on pushing resolution as far as they can- some manufacturers I spoke with at DisplayWeek 2013 even talked about 4K smartphones! It’s a shame because there are many other display performance characteristics that would benefit users. They may sound like less exciting specs but color performance, sunlight readability (a combination of reflectance, brightness and color saturation), and efficiency would all improve usability much more than another 50 or 100 ppi in resolution.